January issue of Rhythm on sale now! This month we find out how Tony Royster jr went from child prodigy to ridiculously in-demand session superstar. The Jay Z drummers tells us all about being a child star, mastering just about every genre known to man, playing for the President and much more. Learn how to nail Billy Talent's Viking Death March, David Bowie classic Ziggy Stardust and Pearl Jam's latest single Mind Your Manners. Plus there's all of your favourite regular lessons from Pete Riley, Jason Bowld, Colin Woolway and more. 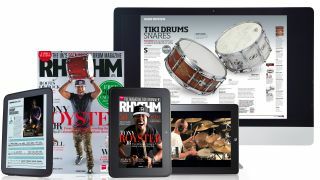 Win a DW Design kit, DW hardware and Sabian cymbals worth £3,587! All this and more in the December issue of Rhythm available now from all good newsagents, online or digitally at the Google Play Store or from Apple Newsstand. Get yourself a copy from Apple Newsstand and enjoy all of our tuition content plus bonus videos, image galleries and other content.